Great Dual Lane Challenge Course! This Dual Lane Obstacle Course is perfect for team building, fundraising and any event where competitive challenge is called for. Two players at a time with multiple elements. This is as versatile as they come. Composed of two main sections each with its own series of challenges, that can be used individually or connected as one large unit. 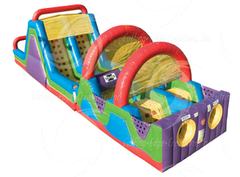 Used in multiple combinations or individually you can create the perfect challenge course your specific situation.